No city in the world can compare to the mystifying beauty of Venice. Situated in Northern Italy this unique, romantic floating city consists of more than one hundred small islands linked by bridges in a shallow lagoon. With beautiful Venetian architecture, a fairy-tale atmosphere and sumptuous helpings of charm to behold, it’s no wonder the city is listed as a UNESCO World Heritage Site. Venice is beautiful at any time of the year. The summer months guarantee hot weather and sunshine, winter tends to be cooler and atmospheric and spring and autumn are pleasant and often less crowded than the summer months. St Mark’s Square (Piazza St Marco) is the principal public square of Venice and of the city’s many squares it is without doubt its most famous. This breath-taking open space is filled with amazing specimens of architecture and has a fantastic buzzing atmosphere. The square is essentially a tourist magnet and thus becomes extremely busy during the day, so it may be that a buying an espresso and gelato and having a wander around will be enough to satisfy yourself that you have been to this obligatory landmark. Or a visit early in the morning or late at evening will ensure you are free from the cruise ship vast masses and allow perhaps a quieter and more tranquil visit. There are several attractions in and around St Marks that you may want to visit, including Campanile di san Marco and St Mark’s Basilica. The bell tower of St Marks Basilica is the Campanile di san Marco. 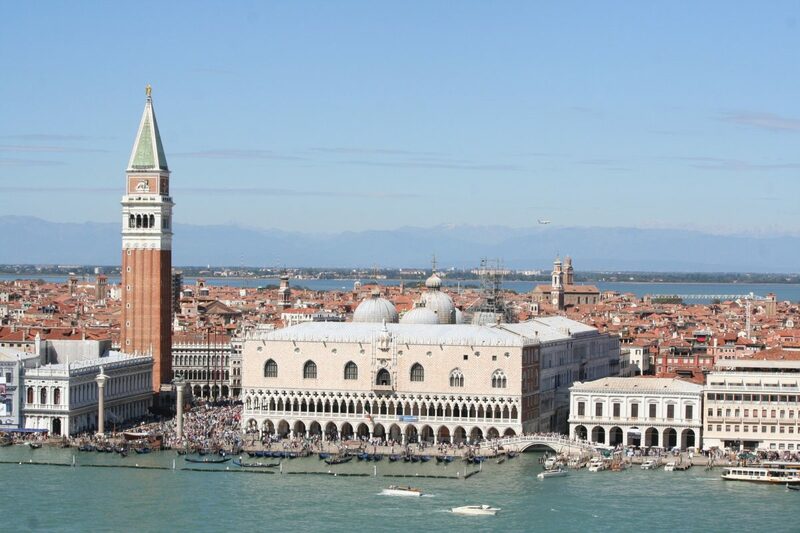 It is the tallest building in Venice and open to the public to enjoy and photograph the spectacular bird’s eye view of the city from the top. St Marks Basilica lies at the Eastern end of the square. Built in the 11th century, this cathedral church of the Roman Catholic Archdiocese of Venice is an awe inspiring symbol of Venetian power and wealth. Well known for its opulent design and its gilded mosaics it is well deserved of its nickname ‘Church of Gold’ (Chiesa d’Oro). Venice has a fantastically vibrant arts scene and on the grand canal lies an imposing neo-classically inspired eighteenth century building housing the Palazzo Grassi. This spectacular contemporary art museum houses major temporary exhibitions and is well worth a visit. One of the world’s most beautiful and historic opera houses is located in Venice –La Fenice. Originally built in 1790, it has twice been burned down and restored to its magnificent, romantic glory. During the 19th century two of Verdi’s most revered works- Rigoletto and La Traviata were first performed here along with many other opera’s first ever performances. An evening watching the opera here would inevitably be a wonderful night to remember. 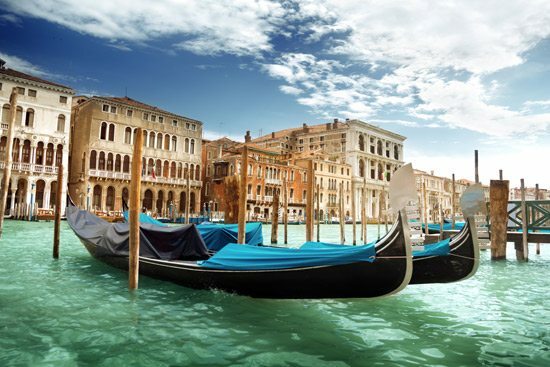 And of course a trip to Venice wouldn’t be complete without experiencing the iconic romance of a Gondola ride. Almost part of a rite of passage when visiting Venice for the first time, gondolas are a centuries old tradition that allow you to see the sights around the floating city. A romantic moon lit gondola ride is said to be a truly magic and memorable experience. 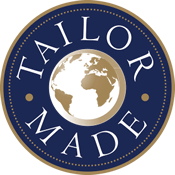 Accommodation can often to be in high demand so it is wise to book early. Although visiting St Mark’s Square is a must see, it does get extremely busy often with thousands of tourists visiting each day (including passengers from the docked cruise ships). So if you prefer somewhere a little quieter then it is wise to book accommodation away from this tourist hotspot. Venetian cuisine is characterised by seafood and there is an abundance of delicious fish dishes served in its many restaurants, often very simply cooked with garlic, olive oil, vinegar and herbs. One of the most famous food specialties in Venice is Risi e Bisi which consists of a delicious combination of risotto rice, fresh peas and thick chunks of pancetta. A top tip is to avoid ordering pizzas in Venice. This is because all the restaurants use gas or electric ovens (much like we could do at home). 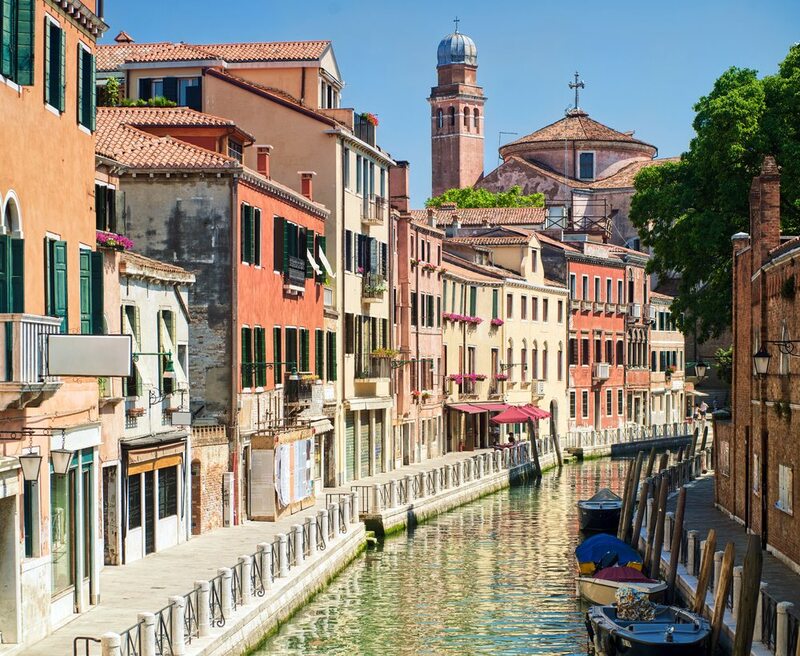 The reason for this is due to the strict fire laws in Venice which means coal or wood burning ovens are prohibited which means you will not get the authentic Italian pizza that you may be looking for. Venice is a wonderful and most alluring city. So buy some comfortable shoes, put on your walking legs and enjoy the unforgettable sights, sounds and aromas this magnificent pedestrianised city has to offer. 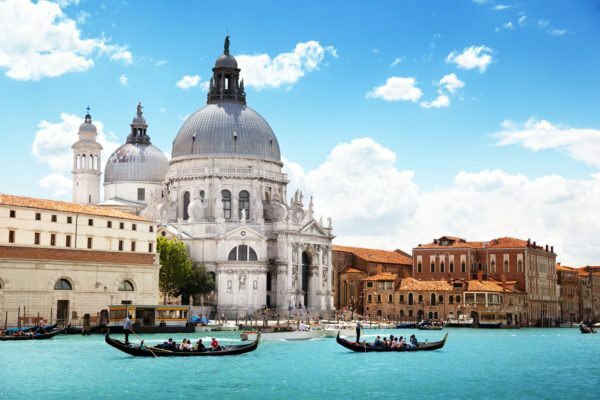 For more information or to book at trip check out our Venice Holidays By Rail or call 01347 825292 for friendly, expert advice.